Around the beginning of my college years, I was introduced to a romhack called Kaizo Mario. I wasn’t playing the game, but we were watching someone else play the game. Basically Kaizo Mario took Super Mario World and made it extremely hard to the point of parody. To a select few, this was a good way to test one’s gaming mettle. To the rest, it was comedic! 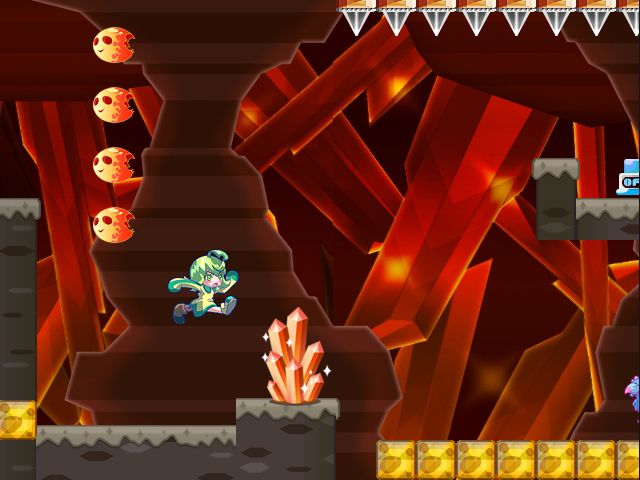 I Wanna Be The Guy, an indie game, took things to the next level by incorporating assets from old games like Kirby, Castlevania, and MegaMan, and making the game downright sadistic. Then came Syobon Action, which was a re-imagining of the first world of Super Mario Bros. and added some twists to intentionally kill the player. This one was more parody/puzzle than actually difficult. 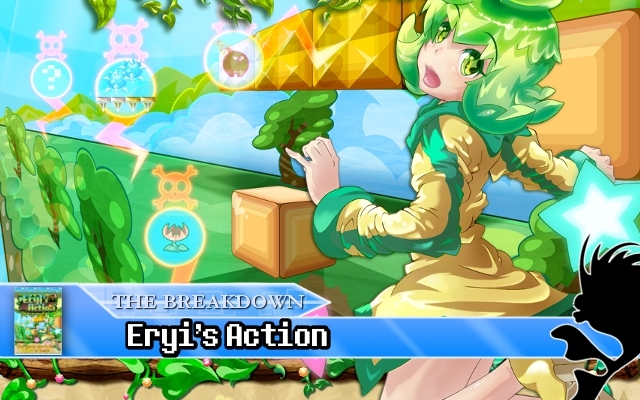 That brings us to today’s game, Eryi’s Action, one of the first (if not, the first) officially published game from this ilk of games. Is it worth buying just to die, or are you better off watching another schmuck die constantly and just laugh at him? After the break, I review Eryi’s Action. I’ll be upfront here and say that this part is probably the hardest thing to review. Since the game is more about trying to intentionally kill you in the most BS of ways and not present a fair challenge, I can’t grade it on the same merits that I do with most other games. Also, I’ll be taking into account my experience with games like Kaizo Mario, IWBTG, and Syobon Action when tackling how this game is made and how clever the traps are. For those that don’t have experience with these games, well, just bear with me for a bit. Let me get the controls out of the way first. Eryi moves a bit slower than you’d expect. 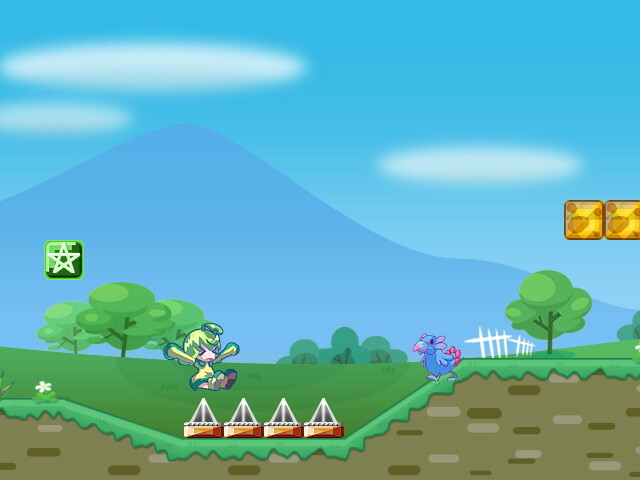 Normally for troll games, you’d move with at least a bit of speed. Here she’s rather sluggish and takes a while to hit her stride. It doesn’t help that her hitbox is also rather large. 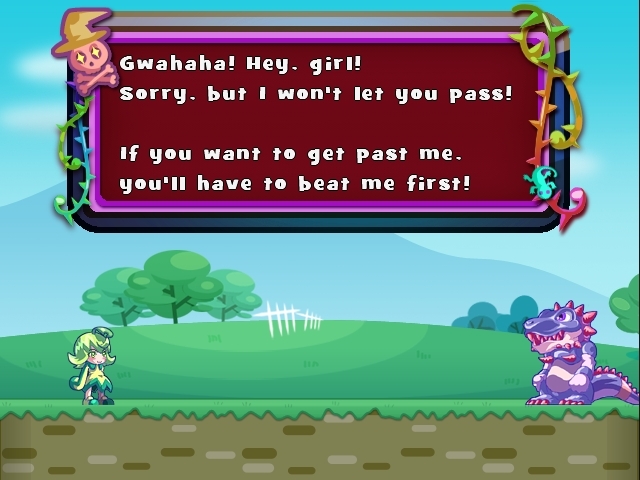 On the plus side, she does have a run button, which is lacking in most troll games (even if the characters themselves already move fast). On the design part of things, there are some familiar traps laid out for you. If you’re used to these games, you can see them happening a mile away. For instance, if you see a row of spikes in the ceiling, you already know that one of them (or all of them) will fall off. Or if you see a single block in the corner, you know that it will kill you. 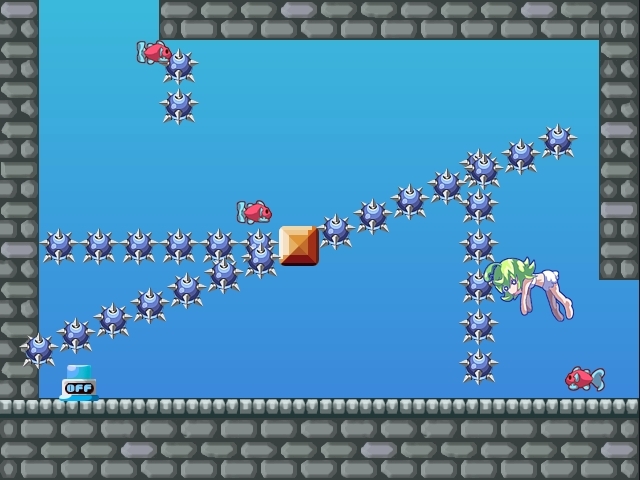 It even includes a Kaizo Trap in the very first stage. 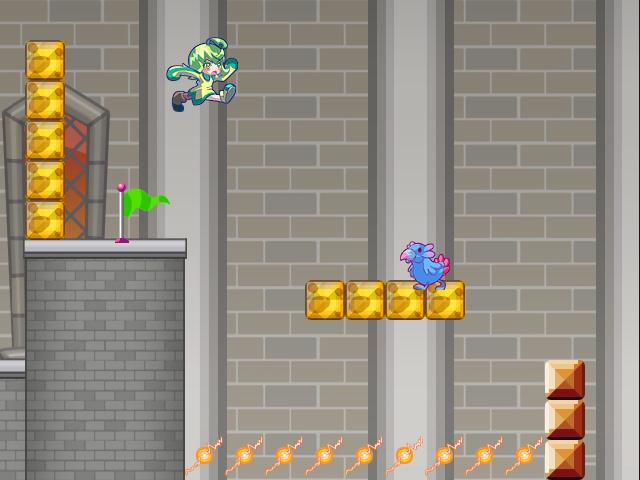 The game does do some new tricks, like enemies that intentionally jump when you close in on them, making you jump on them and bouncing you into a spiked ceiling, Or being stuck to a block with no means of escape while an enemy comes in to finish you off. The game does get a little evil in one spot in the game. Without spoiling it too much, it involves a large “impassable” wall. If you’re a veteran of these game, you might know what to do. For others, this could turn into a nightmare. *A quick warning about some glitches. I’m not knocking points off since this’ll vary from person to person (and I’m still relatively new to reviewing PC games), but I just want to warn you. Along with the aforementioned Full-Screen issue, I had problems going back to the title screen from the game’s pause menu as the game would just hang. The same might occur if you beat a stage. So far this is probably one of the hardest reviews I had to write for a game due to the game’s nature. To review it normally would mean giving this game the lowest ratings possible. But when the negative aspect of gameplay is its intent (in this case, intentionally placed death traps), then things have to be looked at differently. Regardless, if you’re used to these kinds of games, it doesn’t hurt to give it a go. As for those you haven’t played these so-called Trap Games, know what you’re getting yourself into. While the warnings this game puts out there about killing you are tongue-in-cheek, there is some truth them. If you’re able to laugh at yourself (or tolerate others laughing at you), then you might find some fun. If not, then this might not be a game you’ll enjoy very much. Your mileage will vary greatly here. So if you’re curious, ignore my grade and try it out. 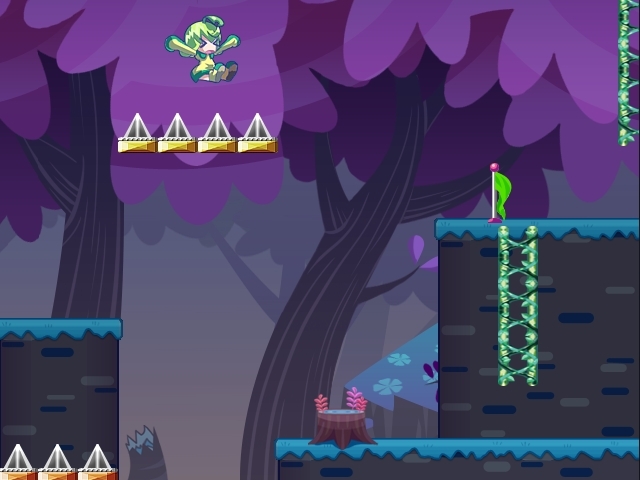 This entry was posted in Review and tagged eryi's action, Kaizo, Kaizo Game, nyu media, Trap Game, Troll Game, Xtal Sword on September 22, 2012 by Steven T..